Does Anyone Know Where the Real Estate Market Is Heading Now? It turns out this can be a very confusing question. A recent post by Greg Cooper on AgentGenius was enlightening to me. Foreclosures are down slightly but by some accounts the numbers of loans that will go into default in the coming years will still go up. New construction surges and new home sales are up substantially but the value of raw land in many places is down. The stock market is up 190 points. The stock market is down 227 points the next day. We created more jobs last month but the unemployment rate went up. Greece is in the financial crapper, California is not far behind and yet Goldman Sachs’ profits could probably save both from insolvency. Units of resale housing sky rocket across the country in April while many in the real estate industry know what’s coming in May. HUD secretary Donovan talks of ending the mortgage interest deduction on real estate as the home buyer tax credits end. Apologies to Robert Lamm and the gang but does anybody really know what time it is? I admit I no longer do. You see ‘the news’ seemingly has now become a universally known spin cycle for the author and/or political action group and the housing industry seems to have lost it’s immunity. If you put the top headlines for real estate across a page and asked most any consumer to tell us what the state of the market was, I’m not sure most would be able to do so. With all of the contrarian points of view out there who can blame them? It’s even gotten to the point where if you watch the average weekend TV talk show, you can count the realities of the market by how many people are in little boxes on the screen at one time. 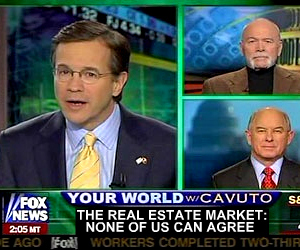 Hey, look everyone… Fox News has got their own version of the Hollywood Squares on every Saturday! Each box has a different pundit taking a different view but at the end of the day nobody has three in a row. Peter, I’ll take Paul Lynde to block please. He what? Oh… never mind. The point of this is that for several years we had this discussion of real estate as if it were a universal, living breathing beast that was behaving nearly the same all over the country. Well perhaps a little worse in Cali, AZ, Nevada and Florida but for the most part we spoke of it as one. Now, as some light shines down the tunnel we’re getting back to realizing just how microeconomic it is. In 2008, if you asked a real estate professional for one word to describe their market you’d get a similar word from most. Occasionally some would even conjugate that word (always good for a chuckle). Today if you asked two Realtors working a 12 miles apart how their market was you probably would get a different answer from each. Then there are the pundits. I may well have to stop listening to any of them for the next few months, peek in on them after the midterms and then start ignoring them again until after 2012. The summary of all of this is that one of the great challenges in my business these days is trying to get my clients and customers past ‘the news’ and on the same page with reality. Given the divergent opinions out there, it’s just another thing that is making any real estate transaction a ‘long putt’ as my brother would say. Checkout the video and let me know what you think? Still confused?